The built-in template color scheme settings provides you with a powerful built-in feature which gives you the control to easily customize the color scheme of the template with a click of a button. We have spit the theme setting options up into a number of sections to make it easier for you to understand and customize the specific areas of the template. Built-in theme is ON – This option will use one of the ready made color styles which comes supplied with the template which you can select from the drop down list. After you have selected one of the ready made styles which comes supplied with the template you just need to save the changes and your website will automatically pickup the new color style. If the Built-in theme option is set to ON then you can not customize the color scheme. Built-in theme is OFF – If you turn this option to OFF then you can customize the color scheme by clicking on one of the color pickers next to each of the settings. 2. For this example we have selected to change the body text color. 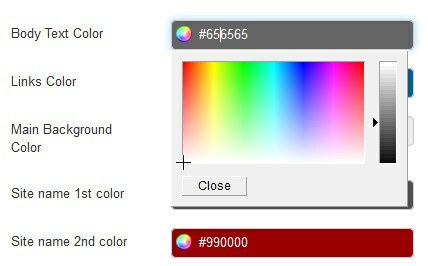 To change the color just click on the color picker next to the body text color and a color picker tool will appear where you can choose the color for the body color. You can also enter the color # value directly into the field you know the color you want to apply to the body text. 3. Once you have changed the color scheme to meet your needs select the Save & Close button to save the changes you have made to the template. The changes you have made will now automatically be applied to the template and you can visit your website to view the changes. If you have any questions about using the color scheme settings log into the website and open a support ticket and we will be happy to help you.